Demarcate functional areas without blocking the light with a gorgeous glass divider. We’ve fallen for open-plan living in recent years. After all, not many of us set aside a room for ‘best’ any more, nor, with modern building materials, do we need four walls for every area so it can be kept at a comfortable temperature. But while open-plan may bring the space, light, sense of flow and garden views we desire, it can also feel problematic to organise into zones – and prove distracting to share. Step forward the glass partition. It makes room division simple, yet doesn’t starve spaces of light or compromise the open feel. Decorative, half or full height, framed or barely visible, it can work in every environment. Check out these schemes. A glass partition is a natural solution when a separation of cooking and relaxing spaces is essential. Here, it’s a framed glass version from above counter height to the apex of the striking sloping roof. Dividing this way will mean that the TV volume doesn’t have to be cranked up to cover up the sounds of extractor fan, dishwasher and running water when the space is being used for multiple activities, but the whole effect is still open. 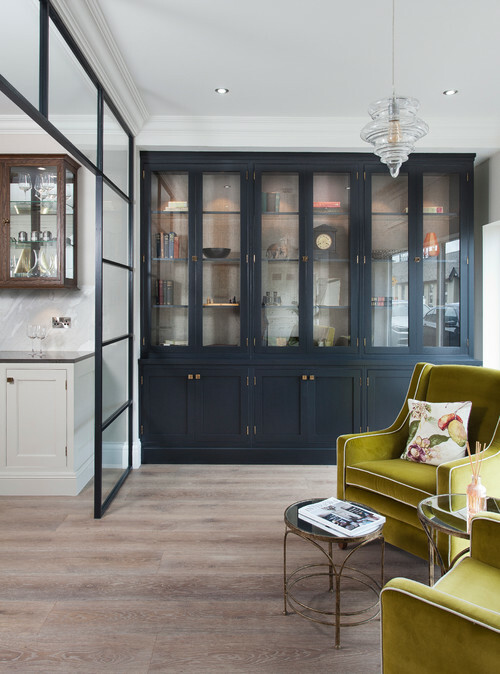 Notice how the cabinetry, partition framing and sofa are linked through colour, while the floor finish is continuous throughout for a pulled-together effect. Is it over for open-plan kitchens? 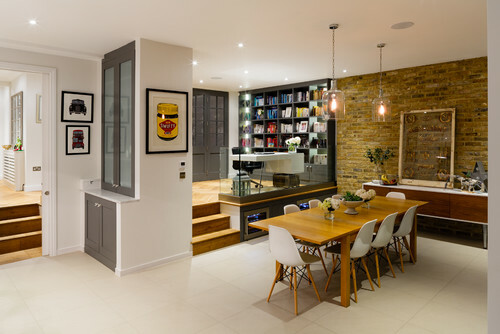 A half-height glass divider is enough to split office from dining area in this home, with a height change between the two areas and a change in floor finish also helping to separate the zone for one worker from the space for socialising. 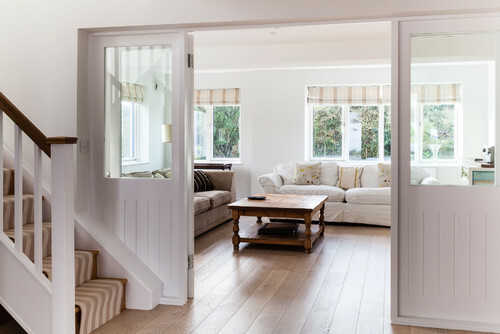 A smaller partition like this one is best employed when noise between the areas of an open-plan room isn’t an issue, whether that’s because two activities are equally quiet or the two zones won’t be used simultaneously. 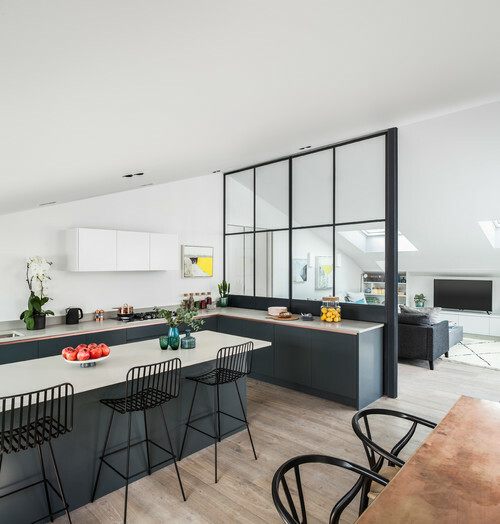 Opening from front to back of a Victorian house can result in a long, narrow room, so a glass partition can help with the proportions of the resulting space without losing any of the benefits of going open plan. Two squarer rooms makes positioning furniture easier, especially if the fireplaces are still in place. Here, the central doors open with fixed panels each side. If you were considering something comparable for your own home, it would be worth weighing up the pros and cons between something like this and a design with bifolds that allow the two spaces to be fully open to each other when desired, depending on how you plan to use the space or rooms. A glass room divider can work by creating an entrance to a new part of an open-plan space, like the kitchen to seating area change in this room. Here, the steel-framed style of the partition elegantly links to the dark cabinetry. Repeating the look? A high-ceilinged room is the best place for this approach. In a less lofty space, a doorway works better than an arch for max head height. 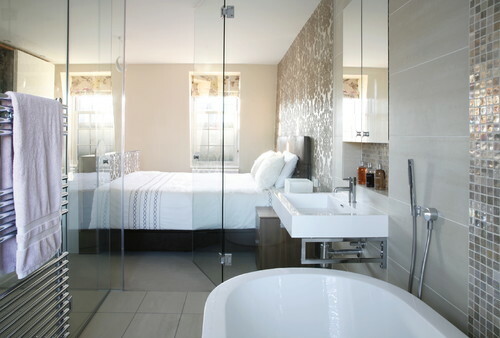 In this home, bedroom and en suite are open to one another save for a glass divider to create a luxurious scheme. The upside of using glass in this type of arrangement is that an en suite gets filled with natural light, where otherwise it might be a windowless and always artificially illuminated room. It also allows a beautiful bath to be a feature of the bedroom, as well as the wash space. In this interior, mosaic tiles that catch the light complement the reflective wallpaper of the sleeping space. When a little privacy is required along with a room partition, glass can do a great ‘you-see-me, you-see-me-not’ job. In this room, it’s there to separate a bathroom from the large bedroom and while it conceals the wash space, it still allows light through. It’s worth considering how obscure you want to make a glass partition. Sandblasting allows control over the level of opacity, and what’s called frosted will be translucent but opaque. Window film is an option for a DIY revamp of a partition from see-through to concealing. The radical transformation of this beachside Devon house involved adding glass at every opportunity to make the most of the wonderful light and views around it. The result of this approach (as you can see in the rest of the project photos) is a very contemporary-looking home, often the case where lots and lots of glass is part of the architecture. But in this area of the house the designer has opted for a nod to classic coastal styling by adding half-glazed, tongue-and-groove-look doors (it doesn’t get more ‘seaside’ than wood panelling). The result? The view of the sitting room from the hall looks instantly characterful, but also wonderfully light and bright. Half-glazed doors come in all sorts of styles and, with roots in the Victorian era, they’re often a good shortcut to adding some period style. In this open loft room, glass separates the sleeping area from the dressing room. The partition is mounted on a dwarf wall that’s topped with wood similar to the floor and beams for continuity of materials across the space. Clear, frameless glass means the dressing area can be seen, so shelving that keeps clothes neat is essential to maintain the room’s calm atmosphere. Consider this idea carefully if you’re prone to messiness, or add closed drawers or doors to your storage. The scheme proves that a mix of super contemporary with ancient and timbered can make for a beautiful contrast.